Flash vs. HTML5 – who will win? 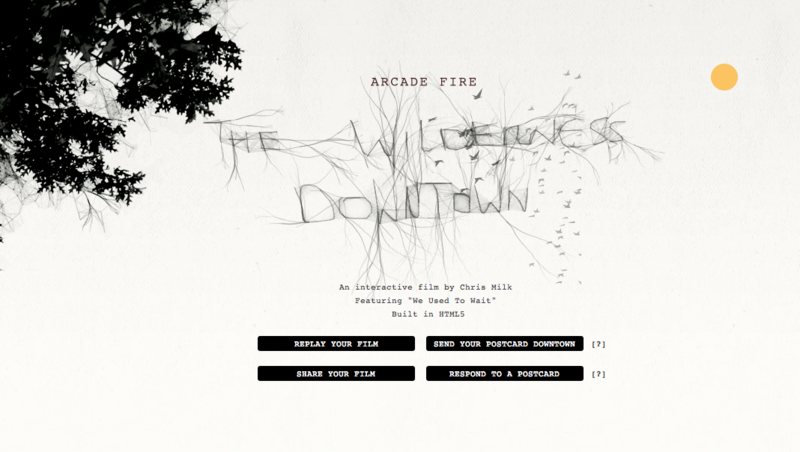 If the Arcade Fire promotional website (The Wilderness Downtown) is any indication, HTML5 all the way. Ad Age recently included the Creativity’s best ad “Arcade Fire: The Wilderness Downtown Trailer” in their morning newsletter, and the ad is amazing. It’s essentially a trailer for the music video. The whole concept was designed by Chris Milk from @radical.media and Google’s Aaron Koblin from the Google Creative Lab. Basically, it’s an interactive music video for the song “We Used to Wait” that utilizes Google’s Chrome Browser and HTML5. You type in the address that you grew up in, and it takes you on a journey incorporating Google Maps. It is way cool and the functionality is amazing. You even get to type a letter to yourself that might be included in the Arcade Fire’s promo stuff. I really hope we see more interactive music videos like this. It gives fans one more way to connect with the music beyond “I like it” to “I’m in it!” And who doesn’t want to feel like a rockstar – or at least to be part of the entourage? This entry was posted on Tuesday, August 31st, 2010 at 10:55 am	and is filed under brand, HTML5, social media, technology. You can follow any responses to this entry through the RSS 2.0 feed. You can leave a response, or trackback from your own site. 1. I and others felt the need to rearrange the pop-ups at first, thinking that we needed to clean them up or try and pull one to the front. It didn’t take long, however, to realize that it was all part of the beautiful plan. 2. It would be nice if it took up the whole monitor — blacked out everything else first. i think it is an amazing experiment. the script — the story of it all was really well written, kudos guys. i can’t wait to see what people think to do with html5 next! Hard to believe that’s even a relative of the lowly (yet reliable) HTML. That’s an amazing amount of work to have cranked that out!! Agreed about the windows overlapping. My issue….pulls a TON of power. But it’s worth it for an afternoon diversion that made me want to drive by my old house…. I’m all nostalgic, now.